Review of Nogne O Porter | Beer Apprentice - Craft Beer News, Reviews, Interviews and Info. Hi guys. 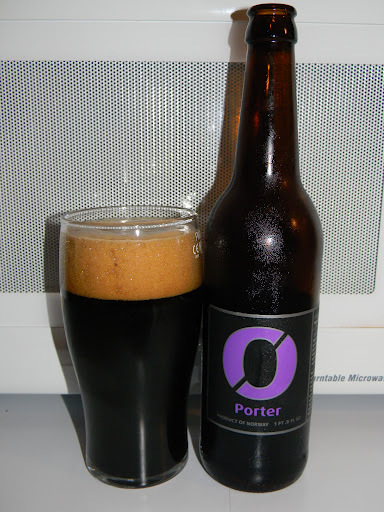 For today’s craft beer review I’m going to be trying the Nogne O Porter produced by Nogne O – Det Kompromisslose Bryggeri A/S located in Grimstad, Norway. This will be my first beer ever from Nogne O. Needless to say, I’m very excited. In this quite dark ale, dark malts provide flavors of coffee and dried fruit. Recommended serving temperature 10°C/50°F. Try with dark chocolate, cheese, or red meat dishes. This Porter has an ABV of 7.0% and it comes in a 16.9 oz. bottle. This beer poured black. That’s about all you can say really. Absolutely no highlights were shown at the bottom or around the edges. The head was tan in color, very smooth, soft and “milkshake” like. The size was excellent, the retention time was pretty darn good and the lacing was sufficient also. It looked nice I thought. The nose brought forth a very prevalent bouquet of dried, dark fruits. Plums and raisins mostly. A mild, roasted coffee essence melded well with the slightly more powering, sweet chocolate malt. Relaxed “woody” hints and subdued zips of alcohol made for a very solid and sturdy fragrance. Well balanced and even. Very nice smelling brew here. The taste was nearly congruent with the aroma. Roasted malt, barley and more of that sweet, dark, dried fruit of raisins and plums. A light bitterness was discovered from the dark chocolate and roasted espresso savors. An earthy, round, gentle woodiness added another small aspect. I didn’t find that this beer was overly complex, but rather just a solid and flavorful beer that tasted very, very good. The mouthfeel was medium bodied. Very smooth, creamy, slick, velvety and slightly chewy. The carbonation was good and a sturdy amount of flavor was left behind on the palate after each sip. The Nogne O Porter is one very good, sound and secure beer. It had a super aroma and a delicious taste. It’s one of the better Porters that I’ve tried in awhile. I thought the drinkability was about right for a beer of 7.0% ABV also. Well enough to enjoy a couple during a session without becoming overwhelmed or fatigued. I would love to pick up another bottle or two of this next Fall or Winter. I think it would be perfect for those cooler days and nights. I would have no problem recommending this beer to anyone. So, if you see a bottle, give it a try. I would love to hear what you think. Thanks for reading and commenting everyone. I appreciate it.